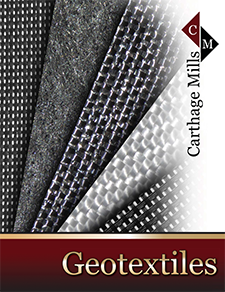 Carthage Mills' FX-A/O Series of nonwoven polypropylene Asphalt Overlay fabrics are specially needle-punched and heat-set to provide an economic solution to extending the useful life of pavement overlays. Reflective cracking – the reproduction of cracks from the original pavement through the new overlay – is the most common cause of asphalt overlay fatigue and failure. These cracks allow surface water to penetrate downward through the pavement, saturating and weakening the subgrade, and accelerating fatigue cracking. Specially developed and tested geotextiles have been proven to inhibit this process and extend the useful life of the asphalt overlay and pavement system. Carthage Mills' FX-A/O Series of Asphalt Overlay fabrics, when installed on a properly prepared surface and sufficient tack coat, improve the performance of asphalt road surfacing and resurfacing up to 50% by reducing the “causes” of overlay fatigue failure. STRESS-RELIEVING INTERLAYER: Inhibits the formation and continuing cycle of reflective cracking. Effects of freeze/thaw are also minimized. IMPROVED ADHESION / BONDING: High retention of asphalt tack coats and resistance to fabric delaminating. WATERPROOFING MEMBRANE: Engineered for maximum asphalt tack coats prevents the penetra-tion of surface water into the subgrade. HIGH SEAM STRENGTHS: Achieve the high seam strengths that are essential in all closure and confinement applications; and allows for seaming to run perpendicular to the centerline in highway construction. CAN MORE THAN DOUBLE THE LIFE OF CHIP SEAL TREATMENTS: High Cost/Benefit Ratio through the addition of elastic waterproofing membrane and interlayer. Carthage Mills' FX-38A/O, FX-42A/O and FX-46A/O are nonwoven geotextiles designed specifically for asphalt overlay applications. Constructed of 100% polypropylene needle punched and heat–set fibers, their ease of installation and superior performance in the field has found favor with owners and contractors alike.